With the sun shining on Willow Lake, basking 67 mushers and more than 1,000 sled dogs in its warmth, the 46th running of the Iditarod could not have asked for a better beginning Sunday. On Monday as the leaders sat in Rainy Pass in the middle of the Alaska Range nearly 150 miles from Willow, we are already beginning to see an early lead pack start to form. And although it is far too early to think about who is winning the race, it is becoming clearer who has the stronger teams. The last time the Iditarod started out of Willow was in 2016, when Nicolas Petit, last year's third-place finisher, threw the gauntlet down early and drove his team of dogs all the way to Rainy Pass on one hour of rest, giving him a two-hour lead on the next team in, eventual winner Dallas Seavey. This year's race has gotten off to a less crazy start — no 200-mile run to Rohn without a rest like Martin Buser in 2013, no run to Nikolai on only four hours of rest like Buser in 2014. This year has gotten off to a more traditional start, and with abundant snow and unknown trail conditions ahead, it seems as if everyone wants to stay within their comfort zone and not get too far ahead of themselves. The first musher to arrive into Rainy Pass was Ray Redington of Knik. He was closely followed by defending champion Mitch Seavey and then Petit. The front pack seems to be on a similar pace to Dallas Seavey's run in 2016. As Monday gives way to Tuesday, there will surely be the first major separation of the field. As mushers leave the Rainy Pass checkpoint on Puntilla Lake, they will climb up and over Rainy Pass summit and then bomb down the Dalzell Gorge before reaching the safety of the Rohn checkpoint. Leaving Rohn, teams will travel over lakes with minimal snow and driftwood, up and over the glacier, through the buffalo tunnels and the burn before reaching Nikolai. The run from Rainy Pass to Nikolai is harrowing in the best of years, and usually it will separate out the contenders from the chase pack. The winner of the Iditarod seems to always be one of the top 10 teams into Nikolai. As the lead pack continues to leapfrog each other, look for the majority of front-running teams to blow through Rohn, only stopping long enough to grab food and straw. Most will travel another three hours down the trail to Tin Creek before giving their team a rest. Then they'll continue to Nikolai, splitting the run from Rainy Pass to Nikolai into two equal runs. • Defending champion Mitch Seavey. who finished second in 2016, 45 minutes behind his son, on Monday was already nearly three hours ahead of his 2016 schedule. • Nicolas Petit, who is undefeated this season, has Monday's fastest team with a run time of 3:17 from Finger Lake to Rainy Pass. Although running fast early on is not always a good thing, if Petit can keep his speed up and his dogs healthy he will be dangerous later on. • As expected, the race for Rookie of the Year is off to a blistering pace. Jessie Holmes was the first team out of Rainy Pass, where he quickly grabbed his gear and opted to camp just a few miles outside the checkpoint away from the fanfare and constant barrage of airplanes landing on Puntilla Lake. Rookies Michi Konno, Emily Maxwell and Matt Hall were all nearly 3 hours off of Holmes's quick early pace. • Start differentials. When watching the leapfrogging of the leaders, remember that mushers left the starting line in two-minute intervals, allowing Cody Strathe (the first to start) to leave more than two hours before Hugh Neff (the last to start). And so Neff, who has made a big push to the front, was sitting in ninth place in Rainy Pass, about two hours behind Redington — but when you factor in his starting position, he was only minutes off Redington's early pace. The start differential is made up when mushers take their mandatory 24-hour layover. As the sun begins to set on the Alaska Range, keep a close eye on the tracker Monday night, because when the sun rises and teams begin to pour into Nikolai, the race will really have begun. Expect the first teams to start arriving into Nikolai around 8 a.m., just in time for breakfast. Jake Berkowitz is a three-time Iditarod finisher, including an eighth-place finish in 2013, when he was awarded the Leonhard Seppala Humanitarian Award. 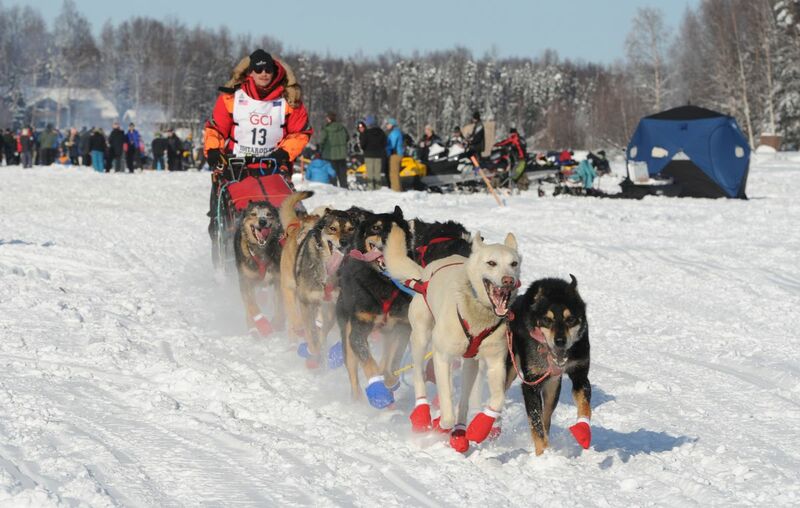 This is his third year of Iditarod commentary for the Anchorage Daily News and adn.com.